Here’s my lesson on how to play the live acoustic guitar version of “Running On Empty” by Jackson Browne. I saw Jackson Browne play this live on a youtube video recently. I’ve always loved the original version of this song with David Lindley playing those great lap steel licks, but I like this live acoustic version even more. To me it’s much more soulful. It’s not an easy thing to get up and play and sing by yourself to a room full of people. If you’re not authentic, you’ll be exposed very quickly! 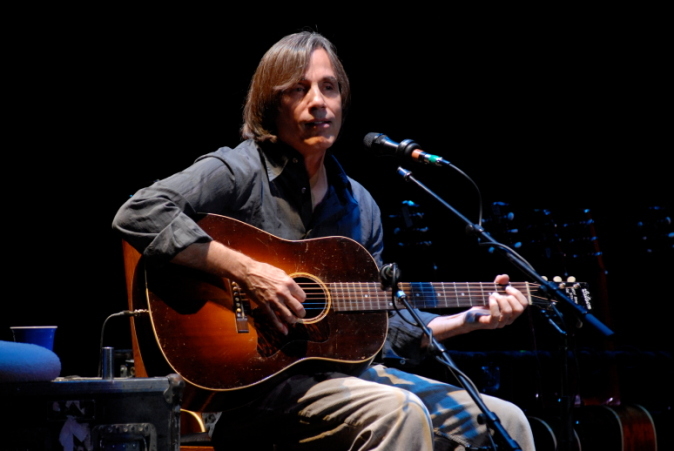 That’s one of the things I love about Jackson Browne, he’s an incredibly honest performer and musician. In the version I watched, there are a couple of flaws as there pretty well always are in live music, but when an artist is honest and authentic, it just doesn’t matter. It’s the overall feel and vibe of the performance that stays with you. Anyways, this one is in open G tuning tuning except for the low E string, which is tuned all the way down to a C note. When you play the C chord, you get that super low C and it sounds fantastic. There are only a handful of chords in it but because it’s in an altered tuning, the fingerings will feel kinda strange at first until you get used to them. Once you do though, the song sounds awesome with this tuning and is really fun to play.